Personalized Chevron Duffel Bag. 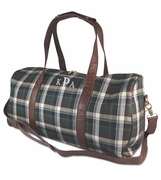 Looking for an attractive and stylish weekend, gym or travel bag. Look no further... carry this beautiful blend of coral, teal, gray and white chevron pattern duffle. Pair it with the matching cosmetic bag item WB-M240MCCL for a complete travel set. Add your personal monogram for a classic look. Personalization included with purchase. 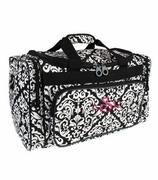 Personalized chevron duffel bag measures 21" x 11" x 10" and includes an over the shoulder removable carry strap.